In Scotland Alex Salmond is now confirmed as the colossus of Scottish politics and is now commanding an overall majority in Holyrood. His party is clear in it's primary objective - an independent Scotland and Salmond will now ask Westminster to allow a referendum on independence within four years. Would anyone bet against him winning it? Critics claim the SNP never campaigned on that fact during the campaign. Why would they? Everybody knows that is what the SNP are about - it's a no-brainer.. He is a tough no-nonsense Scot. Outspoken, blunt, gregarious and an extremely capable political operator. His party has clear unambiguous aims and everybody knows exactly where they stand on every issue from opposing Trident being replaced through to demanding the right to set their own corporation tax. Alex Salmond is not part of the SNP, he is the SNP. Compare the different fortunes of Ieuan Wyn Jones and Plaid. Since the first Assembly elections their vote has steadily declined dropping from 28.3% of the vote, 17 seats and being second largest party in 1999 down to 9 seats, 18% and third place now. Does anyone - even Plaid voters, know where Plaid stand on anything? Do Plaid themselves? Personally I think several factors have lead to Plaid's decline. Firstly the leader. 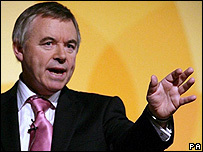 Ieuan Wyn Jones is undoubtedly a good politician however he has absolutely no charisma and lacks the magnetism of Salmond. Charisma and magnetism aren't specific requirements of a politician but in this media-driven age they most definitely are of a leader. He is simply too quiet, too uncontroversial and too anonymous. I doubt he will be leader by year's end but who is of high enough calibre to replace him? Is there a Welsh Salmond? Next is policy. It's a mess. Look at Plaid's position over nuclear power and Wylfa B. Completely contradictory. In Scotland even large numbers of English people vote SNP whereas in Wales Plaid is regarded by nearly all English voters (and a lot of Welsh ones) as something that is going to force them to speak Welsh - which it isn't, and little idea about anything else they stand for. Until Plaid shakes that image it will never ever break-through where it matters - the urban south. Inclusiveness also plays a big part. Salmond always includes another party in everything he does. He's not bothered which and will use the one most sympathetic to his immediate needs at the time. He also pitches at all the inhabitants of Scotland not just the Scots. So inclusive is Salmond's SNP that even people who are outspokenly opposed to independence still vote for him. Plaid however always appears remote, isolated. Then there's the dirty 'I' word - independence. The SNP make no bones about where they stand on it and the Scottish people accept their stance. In Wales however independence is a word not to be mentioned and when it is, immediately shouted down. National identity is another big difference. The Scots regard themselves as a nation and their everyday lives reinforce that point. They have their own banknotes. They have their own Scottish versions of all the main newspapers publishing predominantly Scottish news. They have their own legal system and laws. Even their own 'proper' football league with their teams qualifying for Europe. We do not have that in Wales other than a couple of regionals - The Daily Post and Western Mail. Our main newspapers are English in outlook and content. Our best football teams play in the English leagues. The Scots look to Scotland and Holyrood for leadership and decisions. The Welsh look to London. I can think of half-a-dozen more reasons for the different fortunes of the SNP and Plaid. But I am afraid that unless Plaid becomes more like the SNP and finds itself a leader as tough, limelight-loving, opinionated and high profile as Salmond and comes up with clear unambiguous positions on everything then it will just continue to decline. Plaid needs to re-invent itself and push the position that it is a Welsh party but not just for the Welsh but for all the people of Wales and that it will always put the interests of Wales and all of it's inhabtants first in everything it saysand does. And some bloody policies that people know and can identify with including - just like the SNP, being absolutely resolute and crystal-clear over one particular issue. Independence. Absolutely right, RF. A few years sorting itself out could be in the best interests of Plaid and Wales. But I still don't see a potential leader on the horizon. Though one to watch may be Llyr Huws Gruffydd, elected as a regional member for the north. Aye, a name to watch. The SNP promises to freeze council tax for the next five years ... the SNP romps to victory. There must be a lesson in there somewhere! You're obsessed with council tax KP - outside of England council tax is pretty cheap and not that big a deal to most people. Tax in UK isn't that bad as a rule - it's worse in places like Germany Norway, Sweden, Denmark, Belgium and Holland for example yet they all have higher standards of living along with higher social welfare levels. You see Red Flag, the problem is with you. You cannot accept the blindingly obvious! Relate local wages to local service provision to local council tax charges. I think you will see a major mismatch here on Anglesey. Doubtless you believe all those that voted SNP really want independence. No, absolutely not, they just want cheaper council taxes. KP - I lived in Greater Manchester a few years back. Council Tax was higher there 8 years ago than it is here now. Wage levels were worse there and there were huge pockets of deprivation bigger than the whole of the Anglesey population. When I moved back here even my car insurance halved as did my home contents insurance. Council tax on Anglesey is cheap, wages are low, the services from the council are good - better than most big cities in England that's for sure. You can say all you want but you cannot escape that fact. And secondly the language isn't an issue in the same way it is here. However their banking system is in the same deep doo-doo as everyone elses (except Hong Kong), so they will still be in thrall to the international banking system regardless of how they tinker with edges of the economy. I went to a Plaid meeting, and we spent an hour talking whether the meeting should be held in Welsh or in English or in both, I left half way through it because I wanted to talk about welfare reforms. I had a knock on the door to be asked if I spoke Welsh, when I said not very good they said thank you ok what do you think of the Welsh language it was more important how do I feed my kids..
Then you have Mary Helen Jones telling people they could not rule out a coalition with the Tories, in an old Welsh mining and steel town, I was so gob smacked it took me ten minutes to decide if she was joking and of course she was not, these people have no idea of what the people think they open mouth before the brains lock in. Welsh culture and heritage is a very important aspect of politics,but the overiding problem now and for the foreseeable future is the economy - basically how do ordinary people earn enough to have a decent standard of living; and how on earth do we stop borrowing in order to fund our NHS, social services and the rest of the welfare state; and how do we pay back the money we owe without leaving the nations children with our huge debt? These are the most important questions facing all politicians and all thinking people just now. No party can be taken seriously if it does not treat the people it represents equally and is inclusive of all citizens. Surely Plaid does not want to be seen in the same context as the BNP, yet from comments on this blog and elsewhere that would appear to be a danger. Plaid would never been seen as the BNP, what it has to decide if it's a Welsh language campaigning group, or a political party. Listening this morning it's still thinks the Language is important and it is, but more important then work, more important then welfare, social housing, I do not think so. Do we honestly need Plaid in Westminster? Let them make a bold statement that they no longer need Westminster. That they will only concentrate on the Welsh Assembly. Instead of dividing it's resources and it's talent they should pool them. Another shiney new Anglesey blog. Can't decide who your picture of Alex Salmon looks like the most - Burger Beagle from the Beagle Boys (of Scrooge McDuck fame) or Bingo from the Banana Splits (of 1960's saturday morning TV fame).